FILE - Venezuela's President Nicolas Maduro holds up the National Electoral Council certificate declaring him the winner of the presidential election, during a ceremony at CNE headquarters in Caracas, Venezuela, May 22, 2018. As a meeting last August in the Oval Office, President Donald Trump turned to his top aides and asked, why can’t the U.S. just simply invade the troubled country? 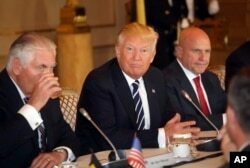 U.S. President Donald Trump, center, sits with then-Secretary of State Rex Tillerson, left, and then-National Security Adviser H.R. McMaster in Brussels, May 24, 2017. Trump’s bellicose talk provided the unpopular leader with an immediate if short-lived boost as he was trying to escape blame for widespread food shortages and hyperinflation. Within days of the president’s talk of a military option, Maduro filled the streets of Caracas with loyalists to condemn “Emperor” Trump’s belligerence, ordered up nationwide military exercises and threatened with arrest opponents he said were plotting his overthrow with the U.S.
“A military intervention on the part of the U.S. empire will never be a solution to Venezuela’s problems,” he said.